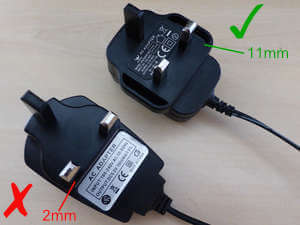 Cheap counterfeit mobile phone chargers and other ac adapters are widely sold online via sites like Ebay. 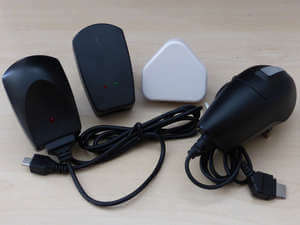 As these plastic encased devices have no metallic parts to attach a test probe, the standard PAT tests for insulation resistance and touch current will not give any meaningful results. This is obviously a concern for those undertaking PAT testing; you could be putting a ‘passed’ label on a potentially dangerous device. 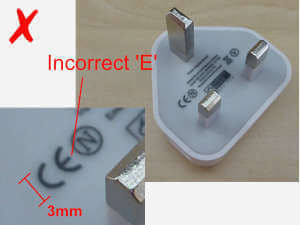 However, there are some basic visual checks that will help you identify these fake chargers and ac adapters. Distance from the L & N pins and outer edge. 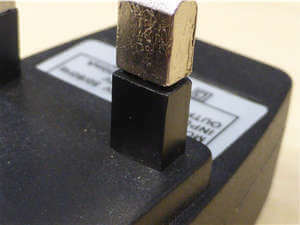 To comply with UK regulations, there must be a gap of at least 9.5mm between the Line and Neutral pins and the outer edge of the device. 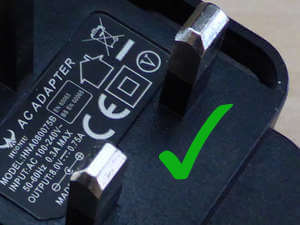 Many of these fake chargers do not meet this basic requirement. 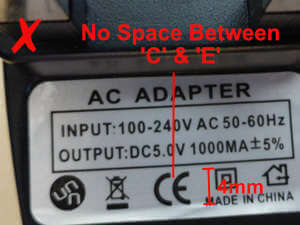 Take a close look at the CE mark. 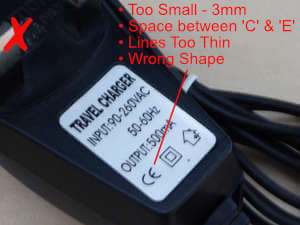 This is often incorrect on many fake chargers. 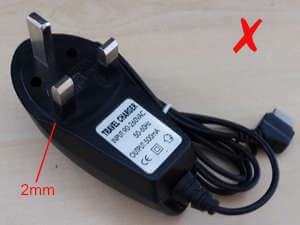 This example was purchased on Ebay for 99p, including delivery from China! The L & N pins are loose, too small, badly pitted with burrs on the edges. The overall quality is very poor. 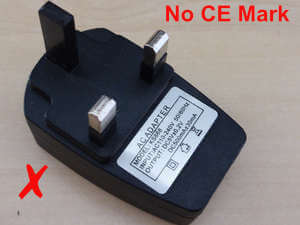 The Electrical Safety Council report that they are often made in China for as little a 3p each.